"The noise was fantastic. The earth moved and shook as a huge trumpeting roar set off all the car alarms. The hairs on the back of my neck stood on end; everyone stood still and listened and then it appeared. I fell in love and I knew I would never forget my first Vulcan display". You don't have to be an aviator to know that low flying in mountain valleys is fun. passes will have correctly guessed that it is challenging, and exciting adrenaline-pumping stuff. his introduction to low flying in North Wales. I want to show you something. "We descended through a break in the cloud cover to low level, very low level, closer to the ground than I had ever been except when landing and accelerated to 420 knots. This was my first experience of low flying in the Gnat and I sat mesmerised in the front cockpit with eyes like saucers as the ground rushed past. Trees, water, stone walls and roads flashed by as we continued to accelerate to 480 knots at very low level. Suddenly we were in a deep U-shaped valley with a cloud-covered rock wall at the far end and, as far as I could see, no means of escape except by climbing, and climbing very, very soon, like NOW ! Next thing, I saw the ground rotate and we were in a hard 5G turn pulling DOWN into the valley floor with about 135 degrees of right bank and descending below the level of the road which I could see above my head. We raced out of the valley, still in the weeds until reaching Bethesda village when with a long sigh he handed over control to me and announced: "That, young Michael, was the A5 pass". I never forgot that experience and during the next 23 years I took every opportunity to revisit the A5 pass in whatever aircraft I happened to be flying. In 1977 I flew it in a Canberra PR9 on a windy day in poor weather but would not care to repeat that frightening experience. I flew it many times in Hawk and Jaguar aircraft. For me it has a mystique unlike any other place in the UK low flying system. 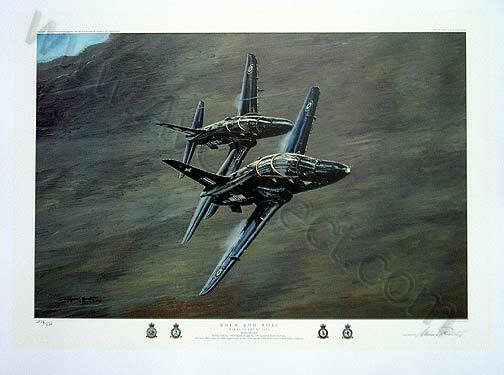 The best students at RAF Valley got the chance to fly the A5 pass in "fighting wing" formation just like these two in my painting, but I dare say the instructors in the back seats are doing the flying"
ROCK AND ROLL represents superb value at just �75. Each copy is signed and numbered and issued with a certificate of authentication to guarantee the edition size of this outstanding print. For something really special, order a 'remarque' copy with a unique original pencil drawing by Michael Rondot added to the border of your print outside the image. Remarqued copies are especially prized by collectors and can be ordered with a drawing to your personal requirements. Order from us direct now to grab your copy of what shall surely be 'another' classic limited edition from Michael.